Do you have a party coming up? 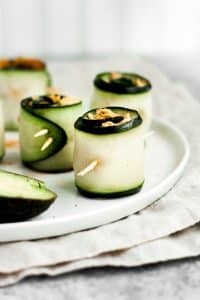 Are you looking for appetizers that are not only keto, but also dairy-free? If so, you have come to the right place! 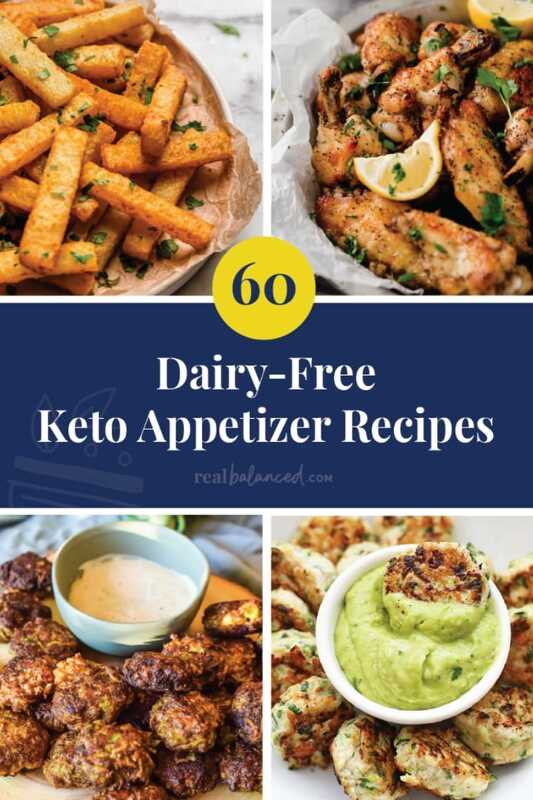 I’ve gathered 60 of my favorite dairy-free keto appetizers right here, just for you! Appetizers have their place in many settings. 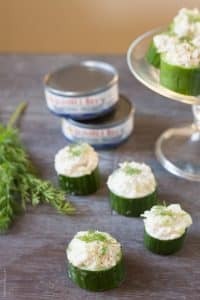 Whether it is a party, a fancy dinner, or any special occasion, a meal isn’t complete without a good appetizer (or two)! 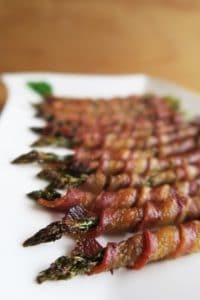 Keto appetizers are extremely easy to find, but it can be difficult to find delicious appetizer recipes that are keto AND dairy-free! 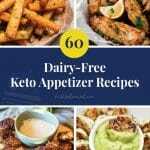 This post contains a variety of keto dairy-free recipes for appetizers that you and your family, friends, and guests will LOVE! 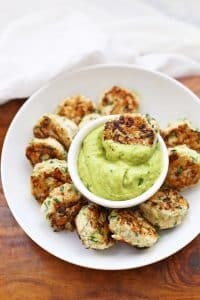 Even if you aren’t dairy-free or keto, these appetizer recipes won’t dissappoint! 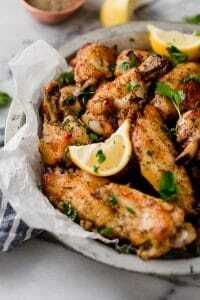 Wings are always a hit at any party! 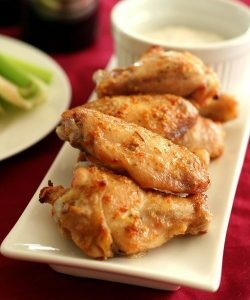 These flavorful chicken wings are dairy-free and only contain 1.3g net carbs per serving! These onion rings are just as crispy and greasy as their high-carb counterparts! 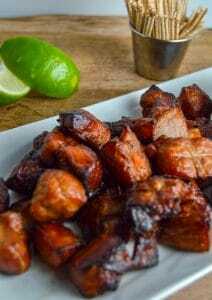 These pork bites remind me of those samples that they hand out in mall food courts! So delicious! Because every good dip needs some good chips! 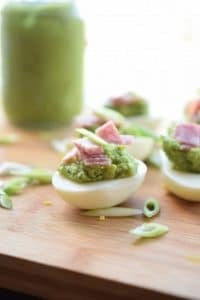 Pesto + deviled eggs = Best. Appetizer. Ever! 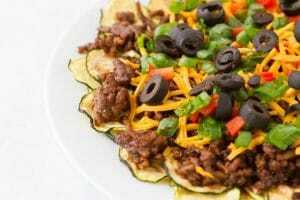 There’s no need for tortilla chips when there are as many delicious toppings as these zucchini nachos have! 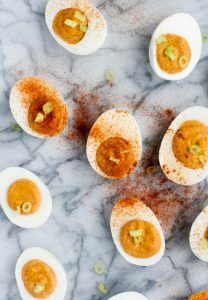 This recipe puts a spicy twist on classic deviled eggs, while still being dairy-free and low in carbs! It’s a win-win-win situation! 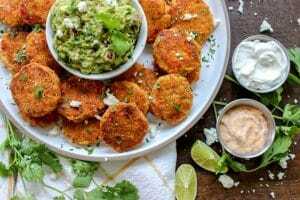 Think chicken nuggets, but flavored with fajita spices and dipped in guacamole! 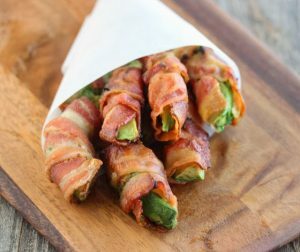 This bacon wrapped asparagus is soooo crispy and only takes 4 ingredients to make! These spring rolls are wrapped in cabbage instead of rice paper and are stuffed with a tasty pork and cilantro filling! 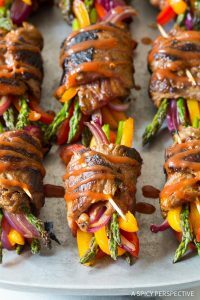 If you are looking for a more filling appetizer, these steak roll-ups are the bomb! 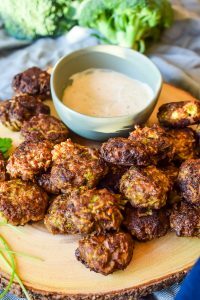 This will be your go-to party snack for when you need an appetizer in a pinch! 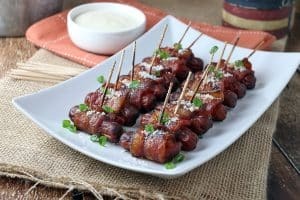 Your guests will be popping these in their mouth without even knowing that they are keto AND dairy-free! 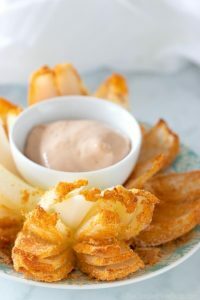 Outback Steakhouse has nothing on this low-carb blooming onion! Your guests will be blown away by the flavor and crispiness of this under-appreciated vegetable! These poppers taste just like an egg roll, but have WAAAY less carbs! 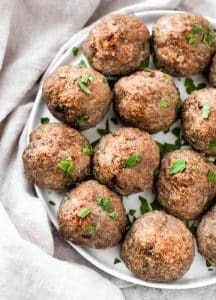 These meatballs have a unique flavor that people won’t be able to resist! 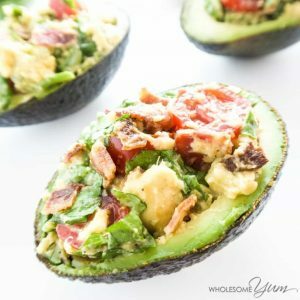 If you LOVE avocado as much as I do, these stuffed avocados will be your new favorite recipe! Since sushi is SUPER high in carbs, these tuna rolls are the next best thing! 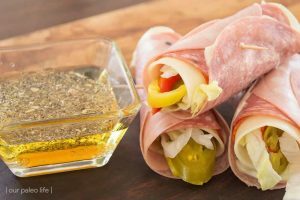 These poppers are super healthy , but don’t lack flavor! I need them in my mouth NOW! 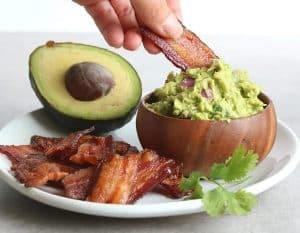 Just thinking about this thick guacamole has me drooling! Plus, the crispy bacon chips make it even better! 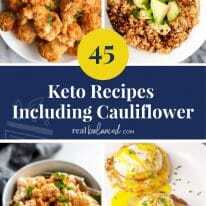 Just leave out the cheese in this recipe to make an easy, but tasty dairy-free, keto appetizer! 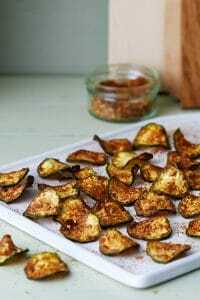 You know those fried pickles that you get at your favorite sit down restaurant? 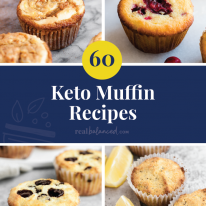 These ones taste even better and are paleo and keto! 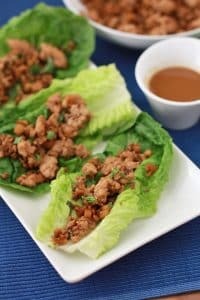 When you need a light appetizer that will have the crowd pleased, these lettuce wraps are the best! 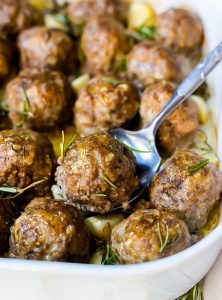 Throw these meatballs in a crockpot for an easy appetizer for any party! 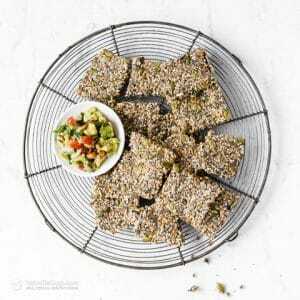 I can’t wait to make these in the summer for a fresh snack or appetizer on a hot day! 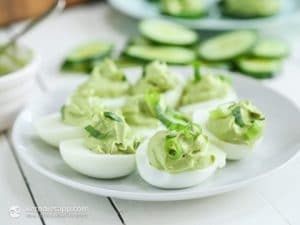 In this recipe, eggs and avocado come together to make a creamy, savory fat bomb! 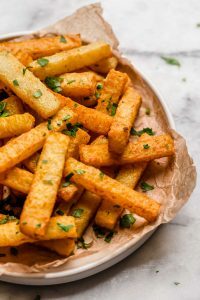 If you miss french fries, these jicama fries are just as crispy and flavorful! 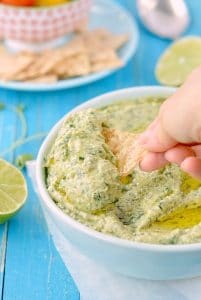 Dip these in your favorite guacamole or salsa for a classic appetizer that can’t be beat! 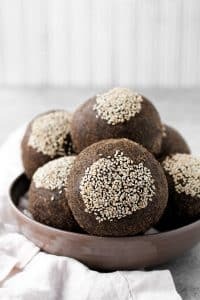 These bread rolls are great on their own, but they are even better when used to make sliders! Yup, that’s right! 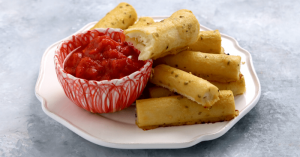 These Mozzarella sticks are keto and dairy-free! 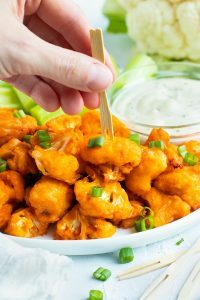 Even if you are vegan or vegetarian, you can still enjoy this tasty recipe on game day! 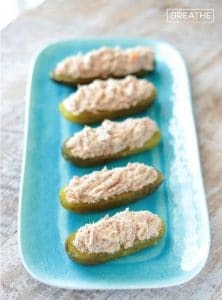 Whether it’s crackers and hummus, crackers and dip or however you like to serve them, you can’t go wrong with an appetizer including these crackers…especially because they are dairy-free and keto! 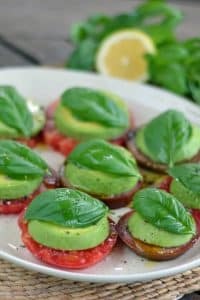 These avocado caprese bites are so refreshing, especially when you pick the vegetables right from your garden! 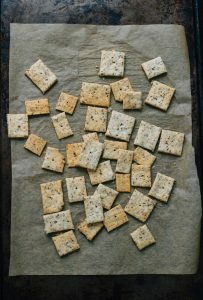 Recipe and photo courtesy of Oh, The Things We’ll Make! 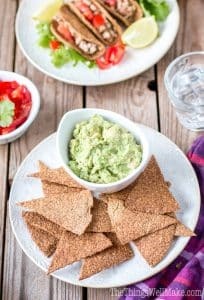 Even if you are short on time, you can still make these low-carb tortilla chips, which only take 30 minutes and three ingredients to make! 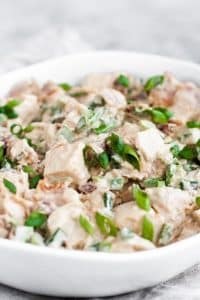 I LOVE eating this chicken salad with some low-carb crackers, and your guests will too! 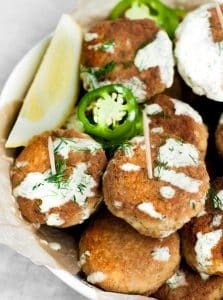 These are an easy appetizer for any type of entertainment! Football, holidays, birthdays, you name it! 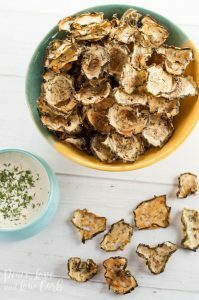 I can’t believe how crunchy and flavorful these chips are, considering that they are oil-free and low in carbs! 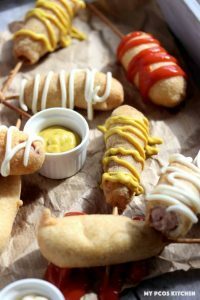 These little appetizers will be gone in minutes! They are sooo yummy! 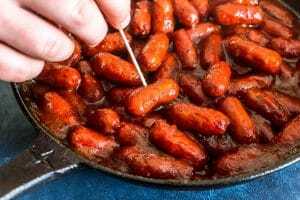 These little smokies are great for the holidays…and the sauce isn’t filled with sugar! 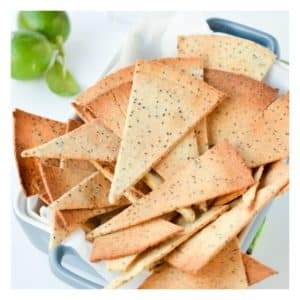 It’s hard to believe that these crunchy crackers only have 2.3g net carbs per serving! 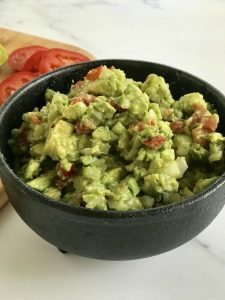 Dip your favorite low-carb chips or crackers into this fresh, chunky guacamole! 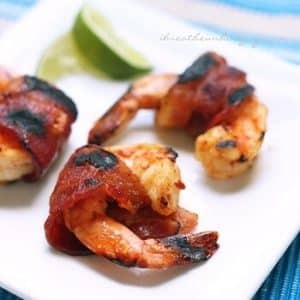 Recipe and photo courtesy of Low-Carb, So Simple! 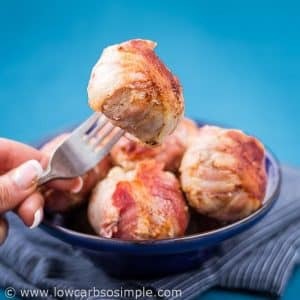 If you are sick of the same, boring meatballs, these bacon-wrapped ones are simple to make and taste AMAZING! 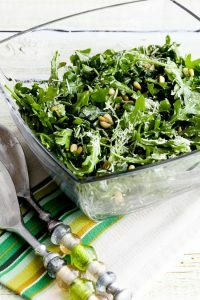 This salad is so fresh and filling at the same time! 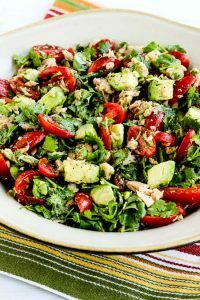 If you want to make it ultra low-carb, use less tomatoes and let the avocados and tuna be the star of the show! 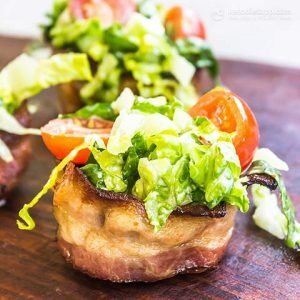 The combination of bacon, lettuce and tomatoes doesn’t need bread to taste AMAZING! These BLT cups are proof! 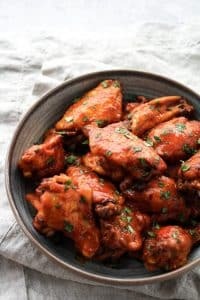 Back off barbecue and buffalo, because thai curry is stealing the show on these crispy chicken wings! They may be messy, but a party is not complete without them! 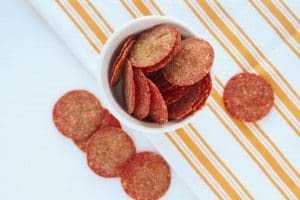 Be prepared to bring a HUGE plate of these to your next party! 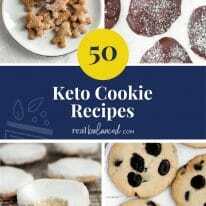 They will be a hit! 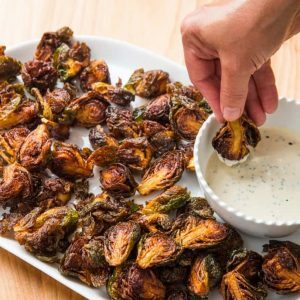 You would NEVER guess that these brussels sprouts were dairy-free! 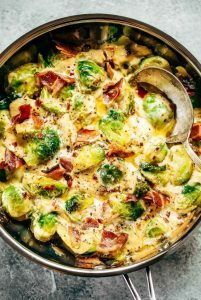 They are sooo creamy and flavorful! 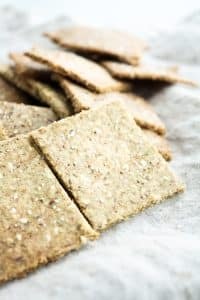 These crackers are nut-free, dairy-free, vegan, keto and go great with any dip or topping! 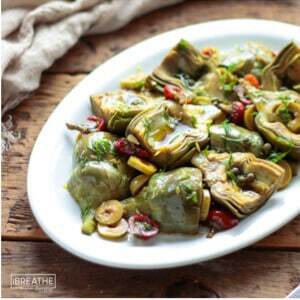 Even if you aren’t a fan of artichokes, this salad will surprise you! Am I dreaming right now? These fries look like the real deal! 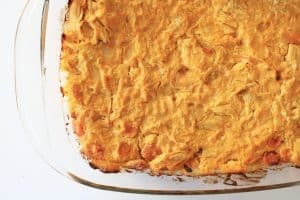 Buffalo chicken dip is something that NOBODY should have to miss out on! 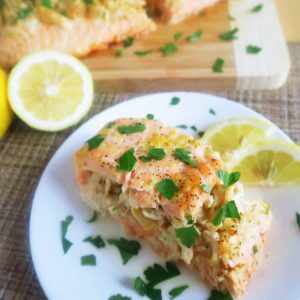 Luckily, this recipe is keto and dairy-free! Every party needs a good salad! 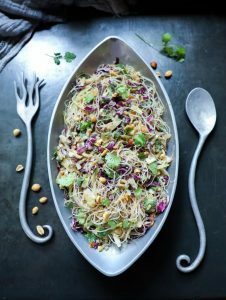 You can still enjoy noodle salad while on a keto, dairy-free diet! This one has an asian twist! 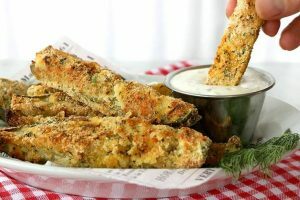 These remind me of those crispy, breaded corn dogs that I used to get at the fair, but they are low-carb! 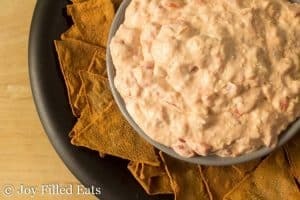 Despite the creaminess of this dip, it surprisingly contains NO dairy and is keto! 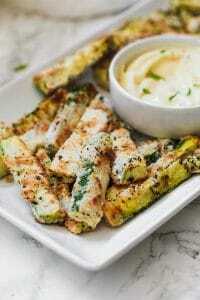 These zucchini fries are far from soggy and are great dipped into mayo, guac, or low-carb ketchup!